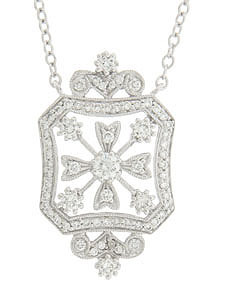 This spectacular 14K white gold antique style necklace is frosted with .65 carat total weight of round faceted diamonds. 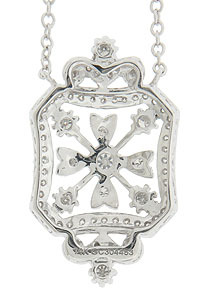 A diamond set floral filigree embellishes the center of the pendant and is surrounded by a curving frame of diamonds. Delicate leaves adorned with a single diamond set bloom crown the sparkling pendant. Set on a delicate chain the pendant measures 1" long, 10/16" wide.